THE HOTTEST RIVER CRUISE DEALS ARE RIGHT HERE! See the Best Deals on river cruises in North America, Europe, Russia, China & Asia. We know everyone is looking for the BEST river cruise “deal,” no matter how wealthy they are. We've also learned that the lowest price is NOT always the best deal, but it helps. Our goal is to always match our customers with the right product at the best available price, which we guarantee to be the BEST VALUE. New ship launches are on the rise. In the next few years, many of the major river cruise lines including AmaWaterways, Avalon Waterways, Scenic, Emerald Waterways and Viking have already or will introduce a bevy of new and exciting state-of-the-art riverships for Europe and Southeast Asia. These ships are sure to take European and Asian river cruising to new heights. The increased supply of river ships will almost certainly create more and more HOT DEALS!, so check this page frequently. Hey... If you're looking for really incredible values at a much less crowded time, check out our Fall and Winter Holiday Markets cruises by clicking this link: Holiday Markets. Hot Deals is updated weekly! Premier's HOT DEALS! page consolidates the best current deals and is updated at least once a week. Use the cruisGENIE™ Cruise Locator chart below to narrow down your search for the perfect river cruise vacation. Just select the river, the cruise line or month you want to cruise and away you go. But don't wait too long to select your cruise or to book, as our HOT DEALS! always go super fast! If you see the words "call" in the price field, it means that we have a "private offer" from the cruise line and cannot publicly advertise the price or any value added features we are offering. For these sailings, it will be well worth your time to give one of our river cruise specialists a call to find out more about the offers. It's generally our BEST offer! QUICK SAIL! 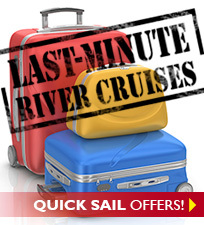 The BEST, "last-minute" river cruise program available anywhere. Just a reminder... If you have the ability to travel with less than 90 days notice, we encourage you to sign up for Premier's Quick Sail! Program... the best last-minute river cruise program you'll find anywhere. When you sign-up for Quick Sail you'll have access to the industry’s “quiet deals.” You know... the ones you never seem to hear about. It’s different, and not for everyone. If you’re interested, take a look. In the meantime, enjoy selecting one of our hot deals from the cruise locator below. If you have any questions or want to book, give one of our expert Personal Travel Planners a call right away. Bon Voyage! Price displayed is Hot Deals price for a window cabin based on double occupancy. For Hot Deals balcony price, call us or use the "Get Quote" button. Thank you for submitting a Quik Quote! A Premier river cruise expert will contact you shortly. Use the CruisGenie™ to narrow your search. NOTE: Prices displayed in the cruisGENIE charts are per person, based on double occupancy, and are for a minimum riverview window cabin. Is this your first river cruise? If this is not your first river cruise, who have you cruised with? Select type of stateroom you prefer (check all that apply). "From Date" must contain a date that occurs before "To Date". YOU MIGHT ALSO ENJOY RIVER & SMALL SHIP CRUISES IN THESE REGIONS. CLICK TO READ MORE. TERMS AND CONDITIONS: Unless otherwise noted, prices and offers are in USD, cruise only per person, based on double occupancy and do not include airfare, taxes or fees. The displayed prices are based on minimum category riverview window stateroom and applicable only to the sailing date(s) shown. Prices for other dates may vary based on the date and stateroom selected. 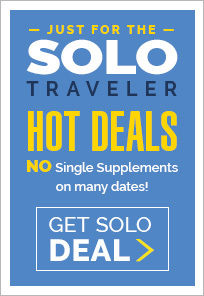 Other than “Hot Deal” offers, price does not reflect any cruise line or Premier savings. Where Premier includes “prepaid tips” in an offer, it applies only to the cruise portion of the trip and not any land portion or shore excursions. VISA® Gift Card offer amounts vary by sailing date and category purchased. To obtain the best price, please use the quote button or call one of our river cruise specialist. Certain discounts or prices may require full payment at the time of booking in order to be eligible. We urge you to book early as river cruises sell out almost a year in advance. Prices and availability may change without notice and are not guaranteed until a deposit is received and applied to your reservation. Call 1-855-255-1200, for complete details. We reserve the right to correct any informational or typographical errors. ©2010-2019 Premier River Cruises, LLC. All rights reserved worldwide. CST #2104636-40.